The i-stop function automatically stops the engine when the vehicle is stopped at a traffi c light or stuck in traffi c, and then restarts the engine automatically to resume driving. The system provides improved fuel economy, reduced exhaust gas emissions, and eliminates idling noise while the engine is stopped. When engine idling is stopped. (Except European model) Engine idling stop conditions are met while the vehicle is being driven. The i-stop indicator light (green) turns off when the engine is restarted. Stop the vehicle by depressing the brake pedal and then the clutch pedal. While depressing the clutch pedal, shift the shift lever to the neutral position. Engine idling stops after the clutch pedal is released. The engine restarts automatically when the clutch pedal is depressed. Engine idling stops when the brake pedal is depressed while the vehicle is driven (except for driving in the R or M position second gear fi xed mode) and the vehicle is stopped. The engine restarts automatically when the brake pedal is released with the selector lever in the D or M position (not in second gear fi xed mode). If the selector lever is in the N or P position, the engine does not restart when the brake pedal is released. The engine restarts when the brake pedal is depressed again or the selector lever is shifted to the D, M (not in second gear fi xed mode) or the R position. Under the following conditions, engine idling stops and the i-stop indicator light (green) turns on. (SKYACTIV-G 1.3, SKYACTIV-G 1.5) The engine is warmed up. The engine is not cold. The fuel injection amount learning, which is performed periodically and automatically, is not being performed. The engine has been started and the vehicle is driven for a certain period. The engine is started with the bonnet closed. All doors, liftgate/boot lid, and bonnet are closed. The temperature setting dial for the air conditioning is set to a position other than maximum cooling (A/C ON). The vehicle's interior temperature and the set temperature for the air conditioner are nearly the same. The i-stop warning light (amber) is not turned on/fl ashing. The keyless entry & push button start system functions are normal. The brake vacuum is suffi ciently high. The steering wheel is not being operated. The vehicle speed is 3 km/h (1.8 mph) or less. The shift lever is in the neutral position. The selector lever is in the D or M position (not in second gear fi xed mode). The automatic transaxle fl uid has warmed up suffi ciently. The automatic transaxle fl uid temperature is not abnormally high. The steering wheel is almost in the straight-ahead position (idling may not stop even with the steering wheel in the straight-ahead position if force is applied to the steering wheel. Release the force applied to the steering wheel to stop engine idling). The vehicle is stopped by depressing the brake pedal. Emergency braking is not applied. The temperature setting dial for the air conditioning is set to the maximum cooling (A/C ON) position. There is a large difference between the cabin temperature and the set temperature of the air-conditioner. The particulate matter (PM) is being removed by the diesel particulate fi lter (DPF). The battery power is depleted for some reasons such as the vehicle has not been driven for a long period. The ambient temperature is high or low. After the battery terminals are disconnected for some reasons such as for battery replacement. After PM removal is performed by the diesel particulate fi lter (DPF). If the following operations are performed while the idling is stopped, the engine will not restart for safety reasons. In such cases, start the engine using the normal method. (Automatic transaxle) With the selector lever in the D or M (not in second gear fi xed mode), the driver's seat belt is unfastened and the driver's door is opened. Power consumption by the vehicle's electrical parts is high. Under the following conditions, the engine restarts automatically. The i-stop OFF switch is pressed until the beep sounds. The temperature setting dial of the air-conditioner is set to maximum cooling (A/C ON). 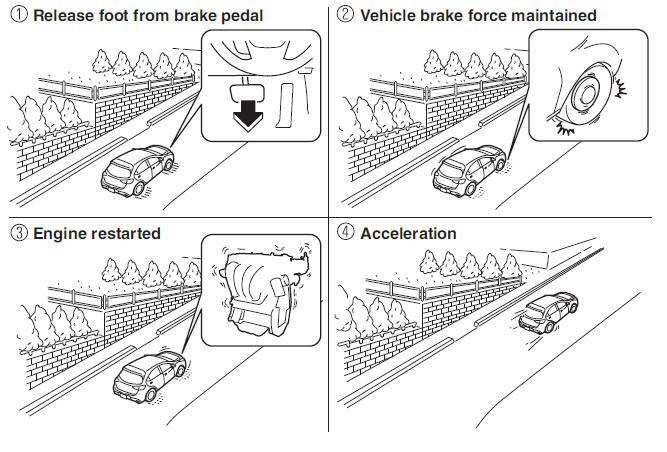 The brakes are released slightly on a slope and the vehicle begins to move. Two minutes have elapsed since the idling was stopped. The battery power is depleted. The accelerator pedal is depressed with the selector lever in the D or M (not in second gear fi xed mode) position. The selector lever is shifted to the R position. The selector lever is shifted from N or P position to D or M (not in second gear fi xed mode) position. The steering wheel is operated with the selector lever in the D or M (not in second gear fi xed mode) position. The selector lever is in the M position and the second gear fi xed mode is selected. (Manual transaxle) With the shift lever in the neutral position, the driver's seat belt is unfastened and the driver's door is opened. (Automatic transaxle) With the selector lever in the N or P position, the driver's seat belt is unfastened and the driver's door is opened. If the selector lever is shifted from the D or M (not in second gear fi xed mode) position to the N or P position, and the driver's seat belt is unfastened and the driver's door is opened, the engine does not restart. Start the engine using the normal method. If the selector lever is shifted from the D or M (not in second gear fi xed mode) to the N or P position, and the driver's seat belt is unfastened and the driver's door is opened, the engine restarts. Engine idling may not stop right after the battery terminals are disconnected. In addition, if the battery is replaced, the i-stop functions must be verifi ed. Consult an expert repairer, we recommend an Authorised Mazda Repairer. To ensure safe and comfortable use of the vehicle, the i-stop system constantly monitors the driver's operations, the vehicle's interior and exterior environment, and the operational status of the vehicle, and uses the i-stop warning light (amber) and i-stop indicator light (green) to inform the driver of various cautions and warnings. On vehicles equipped with the centre display, the i-stop operation status is displayed in the fuel monitor control status display. The light turns on when the ignition is switched ON and turns off when the engine is started. The light turns on when the i-stop OFF switch is pressed and the system is turned off. The light turns on if the following operations are performed while engine idling is stopped. In such cases, the engine does not restart automatically to ensure safety. Start the engine using the normal method. A problem in the system may be indicated under the following conditions. Have your vehicle inspected at an expert repairer, we recommend an Authorised Mazda Repairer. The light does not turn on when the ignition is switched ON. The light continues to remain on even though the i-stop OFF switch has been pressed while the engine is running. The light continues to fl ash if the system has a malfunction. Have your vehicle inspected at an expert repairer, we recommend an Authorised Mazda Repairer. The light turns on while engine idling is stopped and turns off when the engine is restarted. (Except European model) The light turns on when the engine idling stop conditions are met while the vehicle is driven. (Manual transaxle) The light fl ashes when the shift lever is shifted to a position other than the neutral while engine idling is stopped to notify the driver that engine idling is stopped. By depressing the clutch pedal, the engine restarts automatically and the light turns off. (European model) The light fl ashes when the driver's door is opened while engine idling is stopped to notify the driver that engine idling is stopped. It turns off when the driver's door is closed. (Automatic transaxle) The light fl ashes if the vehicle is stopped but the brake pedal is not depressed with suffi cient force. Depress the brake pedal a little more strongly because the pedal force may be insuffi cient. By pressing the switch until a beep sounds, the i-stop function is turned off and the i-stop warning light (amber) in the instrument cluster turns on. By pressing the switch again until the beep sounds, the i-stop function becomes operational and the i-stop warning light (amber) turns off. If the engine is stopped with the i-stop function cancelled, the i-stop function becomes operational when the engine is started the next time. Do not rely completely on the vehicle roll prevention function. The vehicle roll prevention function is a supplementary function which operates for a maximum of four seconds after releasing the brake pedal and accelerating the vehicle from an engine idling stop condition. Over reliance on the system may result in an unexpected accident if the vehicle were to suddenly accelerate. Before starting to drive the vehicle, always confi rm the safety of the surroundings and operate the selector lever, brake pedal, and accelerator pedal appropriately. Note that the vehicle may move suddenly depending on the vehicle's load or if it is towing something. Note that the vehicle may move suddenly after the vehicle roll prevention function is released while the vehicle is under the following conditions: The selector lever is in the N position. If the selector lever is shifted to the N position and the brake pedal is released while the i-stop function is operating, the brake force is gradually released. To accelerate the vehicle, release the brake pedal after the engine restarts and shift the selector lever to a position other than the N position. When the vehicle is stopped on a steep grade, the vehicle roll prevention function does not operate because engine idling is not stopped. The brake pedal response may change, sound may occur from the brakes, or the brake pedal could vibrate from the operation of the vehicle roll prevention function.